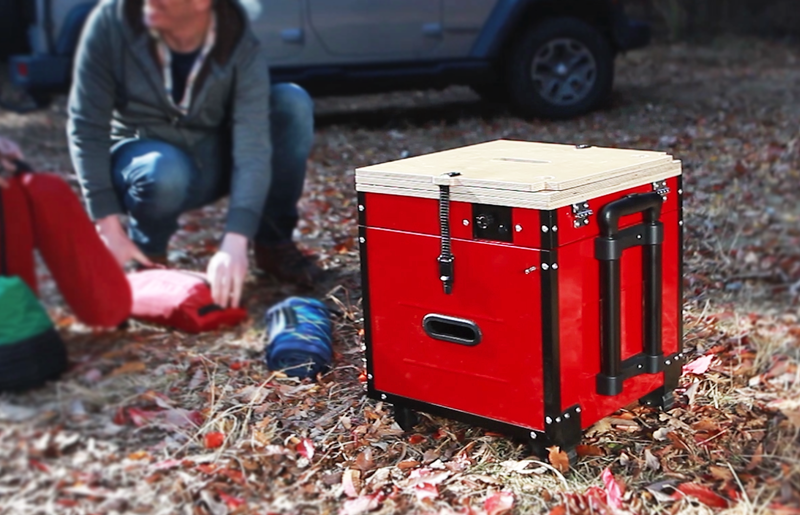 The concept is simple: Put everything you need for a camp kitchen into a single box. A new product called the EatOut does just that. I fall for it every time. Time’s ticking and the car is leaving soon for weekend camping. Somehow, the pots, pans, dishes, silverware, and burners, each packed individually, all find their way into some crevice under sleeping gear and backpacks. The EatOut attempts to solve unorganized camp cooks’ problems. 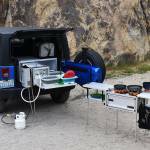 Dubbed an all-in-one kitchen system, the EatOut combines a kitchen utensil rack, main storage, two gas stoves, and three tables, all in a compact box. The whole box folds out from itself to allow for all the workspace you need to cook away from home. The Expedition model holds 51 liters, and the Excursion model holds 37. Unfolded, it seats four or more people at a (small, low) table. EatOut from iKamper launched on Kickstarter with its crowdfunding phase ending January 11. Early bird bids start at $185, with prices increasing for more amenities and delivery options. The cube works with one main storage compartment and all the foldables on top. Fit food, plates, and silverware inside. Then fold it out once you’re ready to cook. EatOut’s Kickstarter video shows the compartment holding an impressive amount of food and supplies as well as the easy-to-clean nature of the surfaces. EatOut is made from aluminum and furniture-grade birch plywood. The burners run up to 8,500 BTUs of heat, with gas canisters beneath for fuel. For portability, a telescoping handle allows you to roll the box, while rubber-coated handles help you lift the box comfortably. The dimensions of the EatOut Expedition model are (in inches) 15.9 x 15.9 x 18.49. It folds out to 5 feet, 5 inches. After the Kickstarter, the Excursion and Expedition models will retail for $249 and $399, respectively. For additional costs, you can add an aluminum stand ($19), LED lantern with stand ($119), kitchen utensil rack ($19), and soft cooler ($39). We have not tested this product, so we can’t speak to its build quality. But if you’re like me and can’t seem to stay organized for dinnertime, the EatOut is an intriguing option.